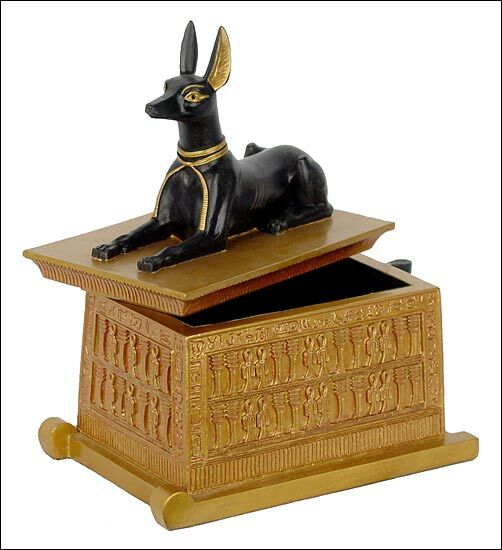 Anubis box, Anubis, Egyptian boxes. This statue of Anubis in the form of a black jackal was found in the entrance to the chamber known as the �treasury�, and was turned to face the burial chamber. It rested upon a chest in the shape of a temple or shrine, mounted upon a portable sledge with four carrying poles. The statue is carved of wood which was then stuccoed and coated with a black resin. The interior of the ears, the scarf and the collar are gilded. Anubis is essentially a funerary god, venerated as the lord of the necropolis. He guides the dead in the next world, watches over them and is considered the inventor of mummification. He is the one who introduces the deceased into the tribunal of judges for the weighing of the heart. This statue was in all probability borne in the funeral procession, and was later deposited at the entrance to the chamber which held the canopic chest. Thus it fulfills the guardian role of this god.